So I'm excited to say that I have recently acquired a Mazda Rx-7! It was abandoned and has been sitting for 5+- years, however I got it to start right up on the second turnover. I have no previous knowledge of Rx-7's or Rotary's in general so this is all a new experience and learning process for me. I'm wanting to find out a little more info about what I have and what the best parts to use for my particular model would be. First off, going by the VIN number (JM1FB3319Fxxxxxxx) and comparing it online to some charts I saw, it matches up with a 1985 Mazda RX-7 with the 1146cc 12A Rotary engine. Is that correct? And are there any variations in the 12A engines or are they all the same? Now from reading around a bit I see there is a rx-7 "gsl" and "gsl-se", ect models. Mine just says Rx-7 on the back and nothing else, so does this mean mine is just plain rx-7 and not gsl/gsl-se? Also could someone explain 6 port vs 4 port and if that applies to my model and what do I have? Now on that note, the first thing I want to do is change the oil, oil filter, air filter, fuel filter, spark plugs, spark plug wires, flush the radiator, new fan belts. Is there anything else I might be overlooking that should be a mandatory change? In regards to spark plugs, I see mixed answers in regards to using straight NGK BR8EQ-14 all around, or mixing and matching leading/trailing with BR9EQ-14 or BR7EQ-14. What's my best bet for a 12A that I'm going to leave pretty much stock. NGK for the spark plug wires? What about Oil, anything particular needed for Rotarys? I read somewhere to not use just regular motor oil and that there is a particular Japanese oil company that sells one specific to Rx-7's/Rotarys but I can't recall the name now. Im looking at the Purolator PureONE PL14459 for the oil filter. Any suggestions on fuel/air filters? Sorry for the long post, and thanks in advance for any advice/information y'all can share! And are there any variations in the 12A engines or are they all the same? yes and no. yes there are variations in 12As, in general, but none that are likely to concern you from a practical standpoint. if you just happen to like knowing this stuff, then there are some differences historically. well, you car is likely to be an S model then. GS, GSL, and GSL-SE had nameplates at the rear. of course, it's possible your car had a nameplate and it got removed somewhere along the way. if your car has manual windows, mirrors, hardtop and drum brakes, then it's probably an S. if it has any of those items (assuming they weren't retrofitted at some point), then you may need to post a photo. if your car is a 12A, then it will say 12A right on the engine, on the driver's side. assuming it's a 12A, then it's a 4 port engine. the GSL-SE was a 6 port 13B. the difference between 4 port and 6 ports are just that. 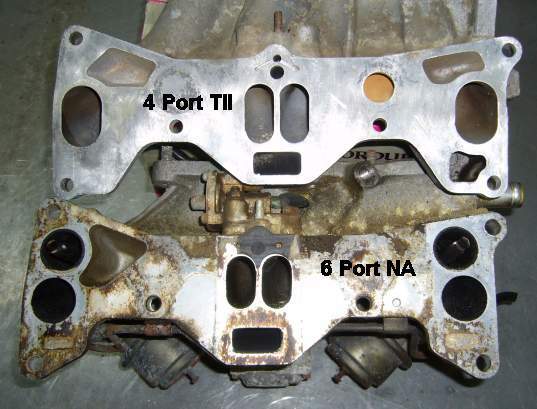 one engine has 4 intake ports (2 primaries and 2 secondaries), while the other has 2 primaries, 2 secondaries and 2 auxiliaries. that's the basic difference. ... the first thing I want to do is change the oil, oil filter, air filter, fuel filter, spark plugs, spark plug wires, flush the radiator, new fan belts. Is there anything else I might be overlooking that should be a mandatory change? i don't this posted enough. so i just wanted to commend you. a tuneup is the first thing you should do to a used car. a tuneup, fluid changes and basic maintenance are always a good idea so you know what you're starting with. you can start with the 8s all around and see how you do. when you use a mixed set, the cooler (higher numbers) plugs usually serve in the trailing position. ultimately, the engine will make the decision for you based on tune, use, etc. just pay attention. Great thanks Diabolical1! That helped a lot! Welcome! You seem to be off to a good start! A tank clean may be in your near future as well. Search "marine clean" in the 1st gen section. Replace fuel hoses when you do. "What about Oil, anything particular needed for Rotarys? I read somewhere to not use just regular motor oil and that there is a particular Japanese oil company that sells one specific to Rx-7's/Rotarys but I can't recall the name now. " Idemitsu makes a full synthetic rotary oil. I use 20w-50. But i hear of people saying not to use synthetic in rotarys. I dont agree with them but you should search for it in this forum. There is a ton of info on the subject! I like to also replace/add the following, although I don't really think that anything is mandatory if the existing item looks OK. Pretty much anything is fine for the street. The OEM wires are about $30 for a set. Rotary engines run pretty clean with Castrol GTX. See the owner's manual or shop manual and use the viscosity recommended for the temperature range of your area. Idemitsu is probably the Japanese synthetic oil that you are thinking of. In my opinion it is a waste of money to use synthetic oil in the engine of a street car unless it is driven in extreme hot or cold weather conditions. Synthetic oil does work really well in the transmission, and since the transmission oil has such a small quantity and long change interval the extra cost isn't very significant. I like K&N air filters because they seem to last forever and you only need to clean and oil them every 50,000 miles vs. replacing a typical paper filter every 10,000 miles. However, disposable paper filters tend to filter-out smaller particles. Otherwise, I don't think it makes much difference which filter you use. engine oil is engine oil, some are better quality and some are not. synthetic or not is a complete massive debate. personally, rotaries run dirty so synthetic is a waste of money. buying japanese "rotary specific" oil, is a waste of money. go to the parts store and buy just about anything that doesn't have a Pennzoil label on it and change the oil every 3k or when it gets dirty, whichever comes first. some people like to run royal purple, the only real difference is that... those people are idiots who like to spend 5 times as much as i do to change my oil. if you're racing the car regularly, it has very very minor benefit and that is an exception. Last edited by RotaryEvolution; 10-18-15 at 09:58 AM. ..Johnson's Baby Oil is recommended if you are gonna baby the car.. If not Castor..I mean Castrol GTX and drive the..well..**** out of it! This is my 78 rx7 sa.